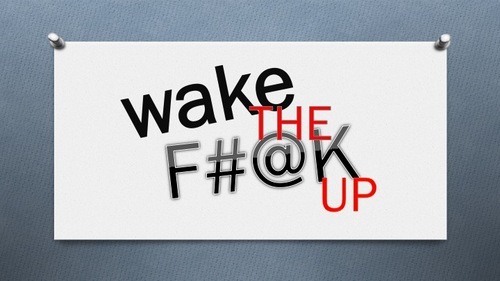 Irish Blog: WAKE to F**K up IRISH PEOPLE ! WAKE to F**K up IRISH PEOPLE ! The first large-scale study to explore surgical outcomes across Europe has found that Irish patients have the highest risk of dying in Western Europe and the fourth-worst mortality rate among 28 European countries. 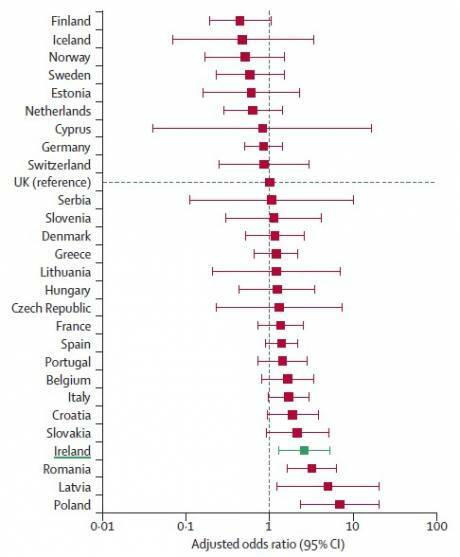 Ireland is placed behind Poland, Latvia and Romania in the overall mortality table, published in a recent issue of the Lancet (2012;380:1059-65), but is worse off than Slovakia or Croatia. However, within Western Europe, patients in Ireland had the worst mortality rates when compared with the UK, with an adjusted odds ratio of 2.61, followed by Italy (OR: 1.70), Belgium (1.65), Portugal (1.43), and France (1.36). Overall, national estimates of death following general surgery have been too optimistic, the study noted. New estimates generated using a snap-shot of death after surgery in more than 46,000 patients from 500 hospitals in 28 European countries indicate that overall crude mortality is 4 per cent, which is more than double previous estimates. In the UK, the mortality rate was 3.6 per cent, well above the highest previous estimates of between 1 and 2 per cent. Ireland recorded a rate 6.4 per cent. Of the 856 Irish patients studied, 66 were admitted to critical care (7.7 per cent) and 55 died in hospital. ....The researchers investigated more than 46,000 general surgery patients, who had all been monitored for up to sixty days after their operation. In the UK, the post-op death rate was 3.6 percent, more than double the figure from an earlier study, which collected data over a much shorter time period. The research also found a wide variation in death rates between countries,: patients in Poland, Latvia and Romania had the greatest chance of dying after surgery, while in Iceland the mortality rate was just 1.2 percent. The study leader, Dr Rupert Pearse, blamed a lack of resources. "Nearly three quarters of patients who died were never admitted to intensive care", he said. "Failure to allocate critical care resources to patients at greatest risk of death is a serious public health concern for patients undergoing surgery in Europe." The UK, which had the biggest number of cases involved in the study, was used as a reference point to compare the performances of other countries. Several other Western European nations had a worse record, including Ireland, Italy, Belgium, Portugal and France. But the European Surgical Outcomes Study also found that heart patients, who are routinely admitted to critical care after a surgical procedure, have a much lower mortality rate of 2 percent. So it seems in all countries a lack of resource after surgery is a big factor in the case of death since those that received critical care (-I guess that would be intensive care to most people), had a lower death rate. In the figures produced by the study for the percentage of people who died in hospital of those considered in the study was 6.4% for Ireland. The UK was 3.6% or almost half. So essentially what all of this means, if recent announcements about cuts in Irish Government's Children allowance, Old Age pensions and disability benefits are correct, is that combined with these reports on hospital surgical care, the bankers take all of the most vulnerable money. All of this with a supposed Labour in Government overseeing this daylight robbery. 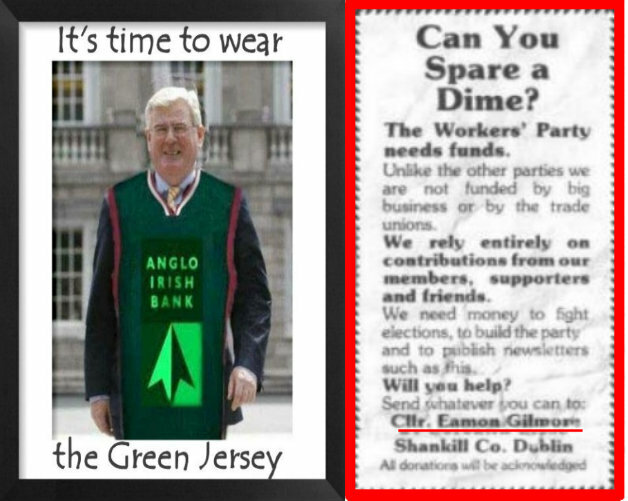 WAKE to F**K up IRISH PEOPLE ! Spain's leader says today, that they don't want a bailout, while their unemployment is nearly 25 percent ! The European system is untenable and the bankers will start another fascist war like last time, to get rid of several million unemployed, while making huge profits with their industrial war complex.